So where do you start with an epic 3d modelling project? Well Google of course and in particular the Google 3d warehouse for Google sketch up. I hit lucky and found that someone had already made a sketch up from photographs of St Pancras. I thought this would give a really good foundation for measurements (I’m not going for an exact scale but as close as possible) because it was picture based. So I started to look at how I transform a 3d SketchUp into a printable model, and its actually not that easy. SketchUps are solid and 3d printing solid objects would cost a fortune, and then there is the issue of extruding shapes and the fact the detail is in the picture and not the model, so after talking with my friend Samir (an amazing 3d artist!) he helped me in using the SketchUp as a background layer and drawing a hollow, detailed model that we could potentially print. 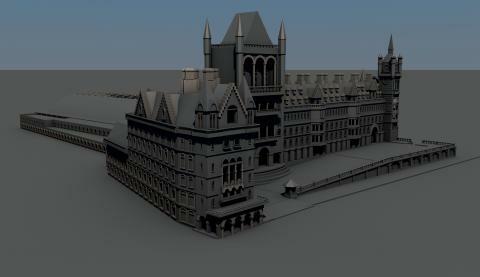 This entry was posted in 2mm finescale, 3d Printing, St Pancras and tagged st pancras 3d printing 3d UP! 3d modelling.